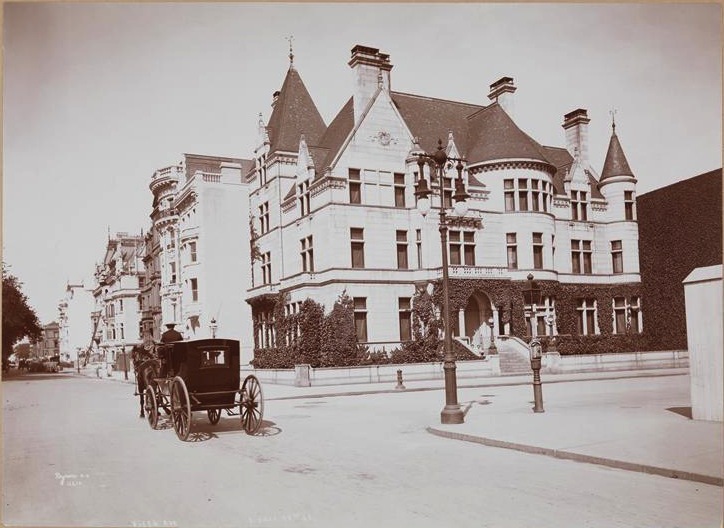 The Isaac Brokaw residence designed by Rose & Stone c. 1887 at 1 East 79th Street at Fifth Avenue in New York City. 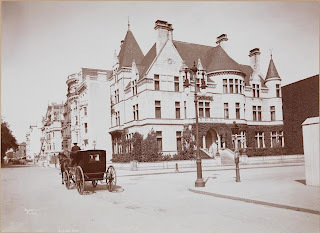 The house is pictured here with an empty lot to the north, one that would eventually be filled with matching townhouses for sons Irving and Howard, both designed by Charles F. Rose c. 1905. The house was eventually inherited by eldest son George who died in 1935. In 1948 the residence was purchased by the Institute of Radio Engineers and demolished amid public outcry in 1965. Click HERE for more on the Brokaw houses. Photo from the Museum of the City of New York. This building, along with Penn Station, were the catalyst for the NYC preservation movement. If you have never seen what replaced this, dont look it up. You will not like what you see. A disatrously ugly apartment tower replacement on a prominent corner. The quick weekend demolition of a grouping of beautiful family townhouses and without any thought of salvaging anything is even more reason to hate the replacement and the developer. At least the legacy of Penn Station and the Brokaw houses, among others, left the NYC Landmarks Preservation Commission with a stronger footing to fight future predatory developers, although at times it feels like one can never let their guard down.. But I Well say that group lasted for nearly 80 years on 5th Ave. That's very impressive. There should be color photos somewhere at least if the demolition. I think the demolition of 660 5th Ave was one of the worst. That was the mansion that changed architecture in New York. The house of Brokaw's daughter Mrs. McNair, by H. Van Beuren Magonigle, immediately to the East was one of the handsomest town houses in the city, with incredible ironwork by Samuel Yellin. Darn progress! Two Mrs. George Brokaws who lived in this house went on to marry famous men (and gain fame in their own right). Brokaw's first wife was Clare Boothe who, after divorcing Brokaw, went on to marry Time, Life and Fortune publisher Henry Luce, become a journalist and writer of drama and fiction. She also become the first American woman appointed to a major ambassadorial post, serving as ambassador to Italy and, later, Brazil. Brokaw's second wife was Canadian socialite Frances Ford Seymour. After Brokaw's death in 1935, went on to marry actor Henry Fonda and the mother of Peter and Jane Fonda. I remember reading in Clare Boothe Luce's biography (Rage for Fame) that when married to Brokaw they lived in the mansion with his mother. As a young, fashionable bride in 1920s New York, Clare found the house gloomy and hopelessly old-fashioned. Agree that picture # 3 is not Brokaw. I can almost place that block but not quite - is it in the 60's ? It looks like it could be 80 - 81. It is definitely the NE corner of 80th...which makes that the Woolworth residence.